" If you are hunting for a wedding photographer, look no further! These guys are, hands down, as good as it gets! Santy Martinez photography was absolutely wonderful! The pictures are breath-taking! Each picture is unique- great eye! They also put us first... we were a bit behind on our schedule, but he and his team were patient and knew how to accommodate. It was fun to have them as our photographers, it was like working with family! They were a hit with our bridal party and our guests. We will definitely use their services in the future for other occasions :) 100% recommend! " " I don't even know where to begin. From the first time we met Santy we knew we were in great hands. We had a blast shooting our engagement session with him and our friends and family still can't stop talking about our photos from it. Santy was so great the whole wedding day...he was there at all the right times but not in peoples faces like I have seen at other weddings. His eye for photography is unbelievable and I can't wait to see all of our photos soon! I love all the teasers he's been putting on social media!" "I can't begin to say enough about you guys! I AM SOOOOOOO happy!!! I know that the pictures are going to be stunning!!!... Amazing to work with and made us feel amazing the entire time! Even managed to get all the shots we wanted in a short time.. it is still all a blur! Would recommend you to EVERYONE!! " "One of the best decisions that my husband and I did in the entire wedding planning was to hire Santy and his team! Him and his wife were more than just photographers the day of our wedding. Annie became my constant reminder and right hand. They were both great. If you are looking for a photographer that is punctual, detailed and professional; Santy is the one to hire. Its an All in One type of deal!! Trust me, you will not regret it!" 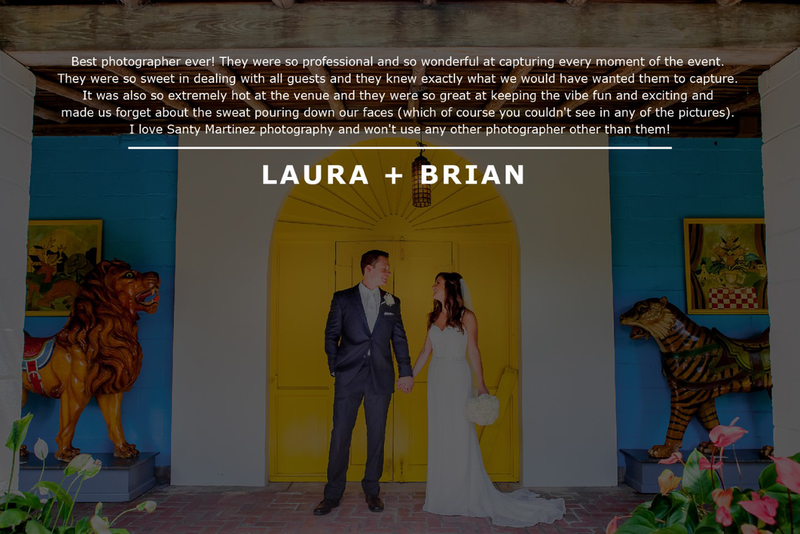 "Responsive, friendly to work with, and amazing photos. Best decision we made (besides saying "I do!") "
"Our wedding was "different", you could say, so when we met with photographers we received a lot resistance and unoriginal ideas...until we met Santy! He was excited and enthusiastic from the get go. His exact words were "you are giving me a new canvas to create art". We were sold! He was very organized, connected and informative throughout the planning process. When our wedding roled around Santy & Annie made my husband and I feel calm and comfortable, as if part of the family. They went above and beyond! Words cannot express how happy and thankful we are for Santy & Annie. We wish we could take them everywhere :). Your wedding day flies by and all you have left are the memories. We're thrilled Santy & Annie where there to capture our memories. " 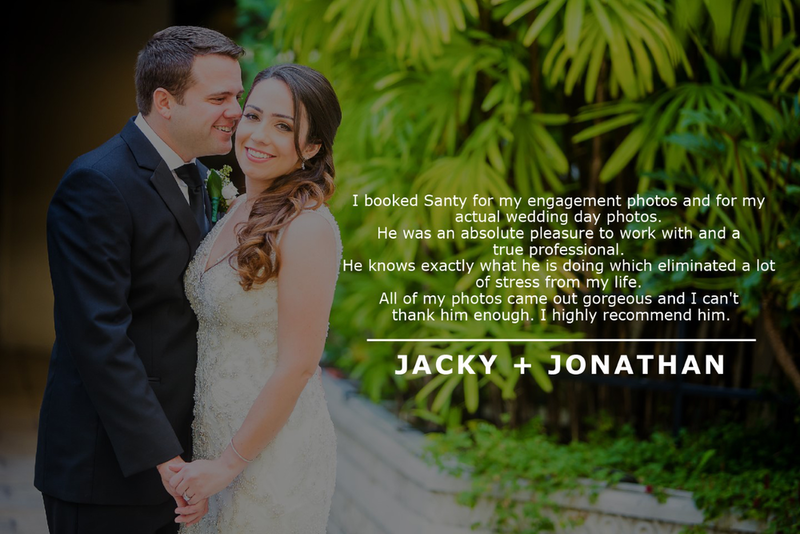 "Let me start off by saying we are very glad we made the decision to choose Santy as our wedding photographer! My husband and I instantly felt comfortable with Santy upon our first meeting. He is very reliable, prompt, and honest! Santy made sure he kept in constant communication and is very professional. Our engagement shoot was a lot of fun and he provided us with our photos in the time frame promised. The photos turned out beautifully and are of great quality! Our wedding day was phenomenal! Santy and Annie were with us the entire day and made the experience stress free! Santy and Annie were selfless and even helped the groomsmen with their boutonnieres! Annie was extremely helpful when it came to getting ready and captured every single detail in the bridal suite! We are extremely happy with our choice and have already sent out referrals to guests who were inquiring! Thank you so much! " " Santy and Annie are wonderful! I had the pleasure of working with them during my best friend's wedding and it was an easy decision to decide to book them for my own! Santy takes control of the situation and works fast which is important during an often very hectic wedding day! He was willing to do whatever it took to get the best shots for me and so far what he has posted on Instagram has been amazing! We can't wait to see all the pictures, thanks Santy and Annie!!! " " Santy and his team are very friendly, easy going and an overall fun team to have a part of your special day. My Wedding day came and flew! So thankful I had Santy a part of my day in capturing all the details and special moments. Santy is creative and will bring a smile to everyone. " " It was such a pleasure to work with Santy and Annie. I wouldn't have thought of two better people to capture the most important day of my life. They made photos so much fun and romantic. " "We used Photography by Santy Martinez to capture our engagement and wedding memories. Needless to say that my bride and I have nothing short of spectacular to say about Santy & Annie! Besides the fact that they are gifted behind the lens, they are extremely professional and very well organized. They made everything very stress-free for us. We definitely and highly recommend Photography by Santy Martinez!!! " "Santy and Annie were absolutely amazing! They made the day seamless and stress free. You will not regret using them for your day! Their pictures are amazing and they are extremely talented! They make a great team!!!!!!! " " Very professional! An artist and simply the best at what he does! His work is amazing! Their team was spectacular and paid attention to detail. Don't look anywhere else! " " Santy is a joy to work with. He has a great personality and is truly talented. We used him for both the engagement photo shoot and wedding. The engagement photos were beautiful and I can't wait for the wedding photos. He is creative and pationate which is displayed in his work and sets him apart from other photographers. I would highly recommend him to all Brides. "